Dedicated audio recorders are getting rarer and rarer due to the ability to record directly to your mobile or computer, but for high quality stereo sound and clip management, these little things are still the way to go. 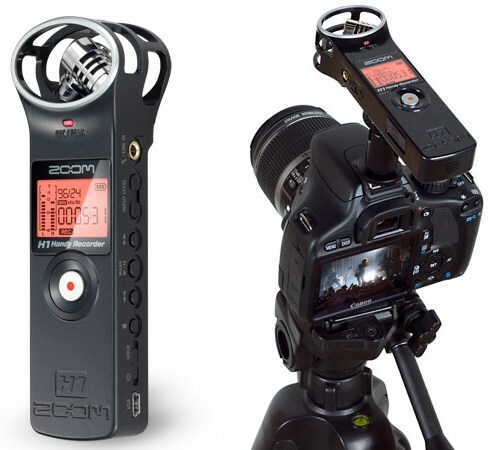 The Zoom H1 looks to be a great option, too: its slim profile makes it a great option for the on-the-go journalist or sample fiend, but it doesn’t appear to sacrifice sound quality — those are real mics on there. I noted in my Canon T2i review that sound was (as it is on all DSLRs) pretty crappy. A pinhole mic recording in mono is a poor complement to the high-quality 1080p video; Zoom suggests using one of these suckers as your movie-making audio device, and I concur. As long as you can sync it correctly (just use the audio input, dummy) it could make for quite the mobile studio. It records HQ audio (24-bit/96KHz, WAV or MP3) to MicroSD, and runs on a AA. I would say that I prefer an internal battery, but the fact is when you’re recording a show or talk, you don’t have the option of plugging the sucker in. The best part is it’s only $99. That’s a pretty good deal, if you ask me.